Despite strong local opposition, the Japanese authorities began offshore construction work aimed at relocating a US Marine Corps base on the island of Okinawa. The US Marine Corps’ Air Station Futenma is being moved from densely populated Ginowan to a less populated location in eastern Okinawa – the Henoko coastal area of Nago. Last week, US Defense Secretary James Mattis and Japanese Prime Minister Shinzo Abe held talks in Tokyo and agreed to go ahead with the plan. The offshore construction work, which started on Monday, will see over 200 concrete blocks dumped in the sea to create a screen, preventing debris and sediment generated from coastal revetment work from damaging the environment. Tokyo will also make sure that an undersea survey in the area is carried out, using the same vessels which earlier delivered the blocks to the site, Kyodo news agency reported. “Based on relevant law, the government will pay as much consideration as possible to the natural environment and the livelihoods of local people as we move forward with work to relocate (the base to) Henoko,” Yoshide Suga, Japanese chief cabinet secretary, said. Around 100 people gathered outside Camp Schwab, another US base near the construction site, to protest the relocation again on Monday. The demonstrators held banners reading “No to new Henoko base” and “Independence from colonialism,” AP reported. Many residents, including Okinawa Governor Takeshi Onaga, object to the heavy US military presence on the island, saying that the Futenma base should be removed, not just relocated. They cite jet crashes related to the US bases and sexual assaults linked to US military personnel as major reasons for concern. 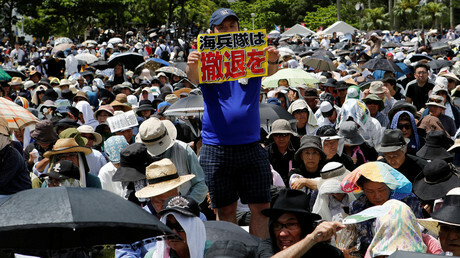 Large-scale protests against the US bases, which gather thousands of people, are staged regularly on the island. Onaga is now expected to refuse the renewal of a permit for moving coral reefs in the construction area, which expires in March, in order to stall the Futenma base relocation, Kyodo said. The Okinawa governor visited Washington last week, reiterating his strong stance against the US bases on the island. “US military bases occupy 6 percent of the whole of Japan and 70 percent of those US military bases are in places where the population density is about the same as Tokyo. I don't like it anymore…,” Onaga said. 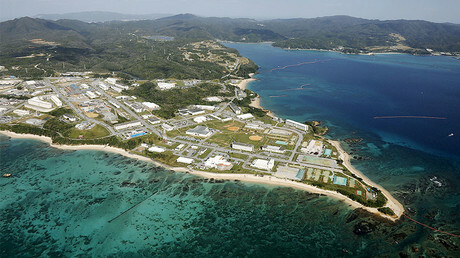 The Futenma base relocation began in October 2015, but was suspended due to resistance from the Okinawa authorities and population. The work was resumed by the government on December 27 after the Supreme Court rejected an injunction order earlier issued by the Okinawa governor. 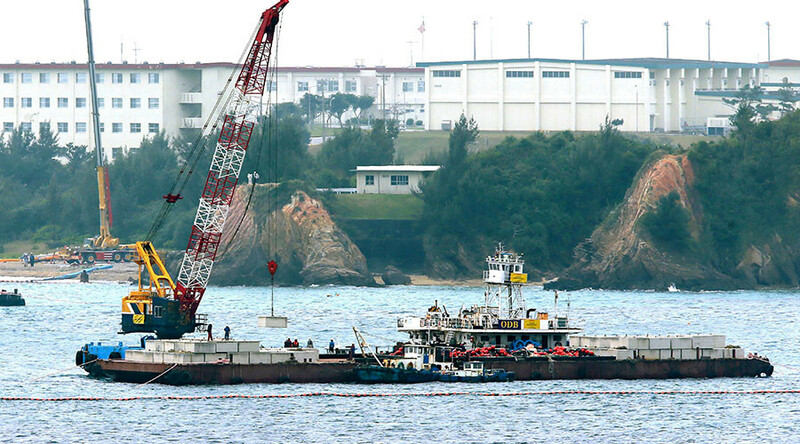 “This is a country ruled by law, and we feel that both the state and Okinawa Prefecture will cooperate and act sincerely in continuing with the reclamation work, in line with the Supreme Court ruling,” Cabinet Secretary Suga said. Tokyo believes that the relocation of the base is “the only solution” to move it away from the densely populated area, while not undermining the Japan-US security alliance.